Current tendencies in educational research in Sweden are presented and compared to Australia. We here refer to; organization of research, research allocation, publication patterns, and assessments of research qualities. Different trajectories of educational research were identified, where Australian research was organized as a field of study, while Swedish research had a disciplinary organization, which now is eroding into a situation more close to the Australian one. In other aspects the Australian and Swedish trajectories seem to harmonize, except for the fact that RAEs in Sweden are initiated and run by the universities themselves. There are also some differences in how research qualities are assessed and the outcomes of these assessments. Given these findings different strategies to deal with the current situation are discussed. RED 10. (2011). Research Evaluation: Reports form the Evaluation of all Research at the University of Gothenburg. www.gu.se/red10. Seddon, T., Bennett, D., Bobis, J., Bennett, S., Harrison, N., Shore, S., Smith, E. & Chan, P. (2012). 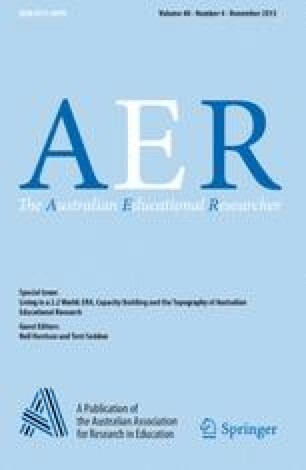 Living in a 2.2 world: ERA, capacity building and the topography of Australian educational research, AARE-ACDE joint report. Retrieved April 24, 2013, from http://www1.aare.edu.au/pages/page116.asp.